The museum lost a key figure from its history on March 26, when James W. Foster died following a short illness. He was 98. Foster, who was known as Jim, was director of the museum from 1963 to 1982, when it was the Honolulu Academy of Arts. The advancements the museum made under his leadership are astounding. His lasting impact is felt every day, from the Robert Rauschenberg painting Trophy V (for Jasper Johns) to the theater where people who like good film go to watch good film. And during that time he and his wife Page Ruth raised three children—Nelson, Robin and Dorothy. Though he left the museum 35 years ago, Foster continued to visit, most recently last September to see the exhibition Abstract Expressionism: Looking East from the Far West. When asked what he thought of the show, he said “It’s an important story.” And his enduring wonder for art is clearly apparent in this 2009 video of him interacting with Harry Bertoia’s Sounding Sculpture, on view in the Modernism Gallery. Born and raised in Baltimore, Maryland, Foster first arrived in Honolulu during World War II, when he served at Pearl Harbor in signals intelligence. He then went on to develop a career in museum administration, working at the Baltimore Museum of Art as assistant to the director then as director of the Santa Barbara Museum of Art before taking the helm of the Honolulu Academy of Arts. At the Academy he made it his mission to develop the collection and increase access not just to the museum, but to art in general. In 1968, Foster formed an Extension Services division to serve outlying communities with travelling exhibitions, lectures, films, workshops, and lending collections. “Suitcase Galleries” consisting of art reproductions and curriculum materials were lent to schools on the neighbor islands and in rural O‘ahu. Fifty years later, the museum continues Foster’s concept with the Globalization Lending Box. For museum trustee Duane Preble, Foster was a mentor and friend who championed contemporary art. “Jim was a wonderful leader in the arts community and he made a major contribution as director,” says Preble. “There were so many ways he got along well with people and got them to appreciate and understand art, particularly contemporary art. In the 1960s he was trying to get the trustees to be more tuned into contemporary art and be willing to bring it in for exhibitions. And he decided a good way to do it would be to bring the S.C. Johnson & Son collection in 1967.” The result was the exhibition Signals in the Sixties, from which the museum acquired its important works by Lee Bontecou and Morris Louis. Foster recruited Preble to organize Art Park, a weekend-long exhibition opening held in Thomas Square Park—that climaxed with an impromptu performance by Jimi Hendrix. More than 50,000 people showed up to experience a sculpture maze; music, dance and theater performances; walking pantomime theater; a film festival; body painting; light artists; sculpture installations and…malasadas and ice cream, because it is Hawai‘i, after all. “The whole idea of that was to bring the community into the spirit of contemporary art, and it did that,” says Preble. Foster also asked Preble, who is a professor emeritus of art at the University of Hawai‘i and, with his wife Sarah, the author of the influential art history textbook Artforms, to give a lecture to the Hawai‘i chapter of the Young Presidents Organization. It was part of Foster’s strategy to cultivate a new generation of collectors and museum supporters. 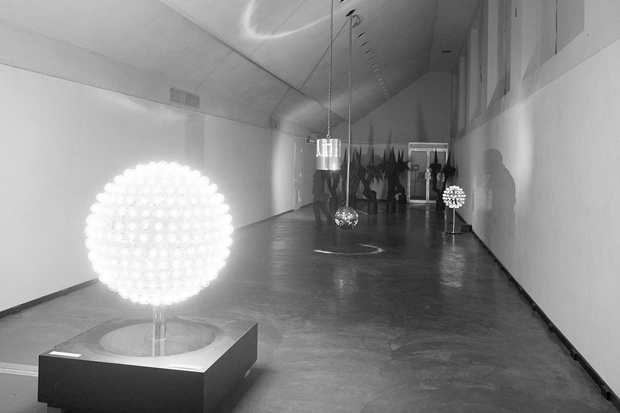 A view of the 1970 Otto Piene exhibition at the Honolulu Academy of Arts. He created memorable art experiences for the city. In September 1970, the Academy was the first American museum to mount a solo show of the work of German kinetic artist Otto Piene. As part of the show, Piene created the sculpture Sky Lei—a flower made of 2,500 feet of polyethylene tubing and 5,000 cubic feet of helium that flew 1,500 feet over Kapi‘olani Park and required a special permit from the FAA. One month later, the museum opened the exhibition Reflections: Honolulu Today. Curated by Foster, it used photography and technology (all visitors became part of the exhibition through closed-circuit television) to ask audiences to consider the city’s natural and built environment. Foster commissioned Hawai‘i photographers Robert Chinn and Robin Lee to capture the essence of Hawai‘i at the time. He said the exhibition “deals with the hypothesis that our urban environment has a telling influence on our daily lives, affecting us in degrees from good to bad, pleasure to distress…What can we hope for Honolulu? Each resident has a personal stake in its development. The exhibition may provide a clue to the role each of us can play in shaping Honolulu’s future.” The Advertiser called the show “a thought-provoking exhibit” that “deserves the attention of all of us who desire a harmonious city of the future.” It is an exhibition that would be just as timely today. During Foster’s time, the Academy hosted exhibitions of the works of Hans Hoffman, Morris Louis, Emerson Woelffer and Mark Tobey; and brought in an internationally recognized travelling exhibition of Namban art. But he also turned the spotlight on Hawai‘i artists, mounting exhibitions of work by Toshiko Takaezu, Edward Stasack, John Wisnosky, Francis Haar, Joseph Goto, Kenneth Bushnell, Murray Turnbull, to name a few. A popular 1973 exhibition on Hawaiian Quilts presented by the Academy, the Daughters of Hawai‘i, and the Mission Houses Museum, generated a catalog and a permanent reference file of Hawaiian quilts in the state. 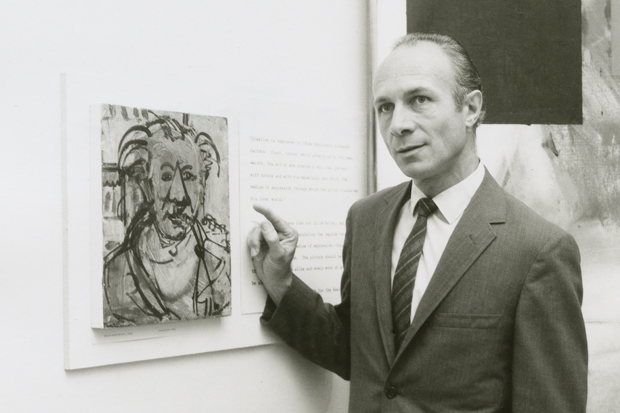 In 1966, Foster started the artist-in-residence Studio Program. And he aimed high, sending this letter to Robert Motherwell: “Our art community is growing in size and vigor; the University of Hawaii has a large, fine department. There is evidence of vital creative activity, and our aim is to stimulate it as much as possible.” While Motherwell politely declined, Foster secured such artists as Cleve Gray, John Hultberg, Matsumi Kanemitsu, Kurt Kranz, Boris Margo, Gabor Peterdi, Rudy Pozzatti, Emerson Woelffer, and Adja Yunkers. They all taught 12 hours per week at the museum’s art school for a semester and had a private, air-conditioned studio, and a solo exhibition. 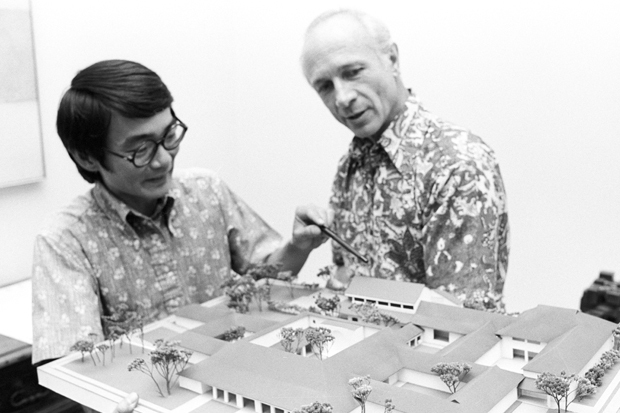 Jim Foster and architect John Hara review the model for the Clare Boothe Luce Wing in 1976. Foster set records for acquisitions and gifts. “He was atuned to collectors nationally and internationally,” says Prebel. “He traveled and kept track of what was going on in contemporary art and who had the best collections. He also had ideas about who the artists were that he wanted to collect. His knowledge was a major factor.” Another factor was “his way with people,” says Preble, something everyone who knew him will echo. 1969: Picasso, Pipe & Glass; John Singer Sargent, Portrait of Mrs. Thomas Lincoln Manson, Jr. The museum raised $1.5 million from more than 800 individuals, foundations and corporations to build the Clare Booth Luce Wing designed by John Hara and Associates. It opened in 1977, to celebrate the Academy’s 50th anniversary. The wing houses the museum’s gallery for contemporary art, administrative offices, and the Doris Duke Theatre. Even after 50 years and the campaign to build that wing, the museum didn’t have a formal fundraising procedure. In 1979, in response to inadequate yearly operating income, Foster established the museum’s first “Fund Development” office and launched its first Annual Fund Drive. With the help of more than 100 volunteers and the support of the board, the drive exceeded the $200,000 goal by $11,700. Today the museum continues to build on all the foundational stones Foster laid. Museum staff will miss his warm, dapper physical presence, but are comforted to know his indelible legacy remains. Archivist Dawn Sueoka contributed to this post. Jim Foster was a remarkable museum professional and his achievements left an artistic legacy that continues to benefit everyone in Hawaii. He transformed this museum and brought art to our community that has positively affected many generations of artists and other museum visitors. Jim ran the institution when I was a young student in the studio art program, and his good work directly changed my life forever! I am honored to have known Jim personally. Our thoughts are with his family. von Furstenberg’s holiday festivals, celebrating the full range of Hawaii’s ethnic diversity. inspirations for an ongoing, good and creative life. Thank you so much for sharing your memories of Mr. Foster and the Academy! Clearly all of his accomplishments extend far beyond what is covered in this blog post. Lovely tribute Sanna! I was lucky to have worked two years under Mr. Foster’s tenure before he retired in 1982. I was hired as secretary to his right hand man, Assistant Director Seldon Washington; my first real job right out of college. I have wonderful memories of simpler and happy times back then. And my memory is long. The comments from those who knew Jim and worked with him are a fine, revealing tribute to Jim’s many major contributions. He shaped the direction and substance of this great state resource, Hawaii’s art museum, the Honolulu Museum of Art. On a personal level, Jim was a mentor who brought me into the museum which became a major part of my life. 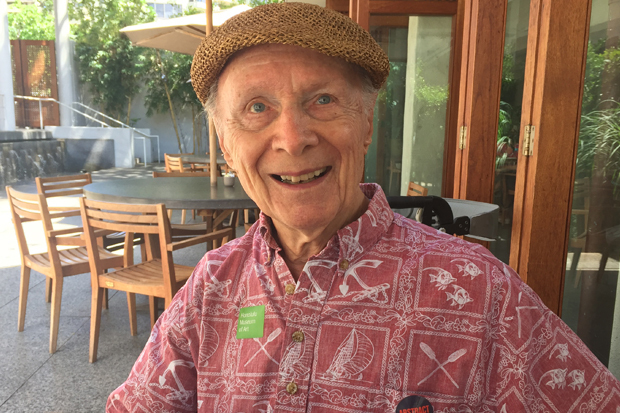 My husband Jim (known at the Academy as James Henry) was so fortunate and forever grateful that Jim brought him to Honolulu to develop education programs for the community. There are not enough words to enumerate the many ways he supported James Henry as he worked with community groups like the Chinese University Women and others, established a docent program, created audio-visual materials relating to exhibitions, and developed the program for the theater. Jim Foster was a supervisor without peer and before James Henry Furstenberg died, he asked me to invite his old boss to write a description of the job he had envisioned for him. This was read at the memorial service. I personally treasured the warm hospitality of Jim and Page, as well as friendships with their three wonderful children. A final observation, we could all learn from the positive way that Jim adjusted to being a widower and contented former director.